by Jeffrey A. Gill, D.Min., Ph.D.
At Grace Theological Seminary, an important part of what we do is help students develop a healthy thought life. Here’s a Scripture verse worthy of pondering “Let the Word of Christ richly dwell within you with all wisdom teaching and admonishing one another with psalms and hymns and spiritual songs, singing with thankfulness in your hearts to God” (Colossians 3:16). Our thoughts affect our relationships. Teaching and admonishing one another. What is the goal of our teaching and admonition? Col. 1:28, We proclaim Him, admonishing every man and teaching every man with all wisdom, so that we may present every man complete in Christ. In every relationship I have with other believers, my goal or purpose should be to assist him or her in becoming complete in Christ. This doesn’t mean I always do the talking. In fact, sometimes the best teaching I can do is to model listening to others. Sometimes it means taking harsh words from others and not returning evil for evil, not being defensive and angry, but entrusting myself to Him who judges righteously. Isn’t it interesting that the same result or fruit occurs with being “filled with the Spirit” as with “letting the Word of Christ dwell in us richly?” It’s because the Word of Christ is energized and empowered by the Holy Spirit, and that’s when our lives are transformed toward completion in Christ. Do you know anyone who on a consistent basis over a period of many years has let the Word of Christ richly dwell in them? What happens when you are around him/her? How are you affected? Our thoughts affect our attitude. Singing with thankfulness in your hearts to God. Without a doubt one of the key theological truths is all Scripture is that God is full of grace. An understanding of grace leads to thankfulness. An entitlement mindset leads to ingratitude. We won’t be puffed up with pride. We will be transformed. We will love our Savior more and more, and we will become like Him. And that’s true for all of us, not just seminary students. 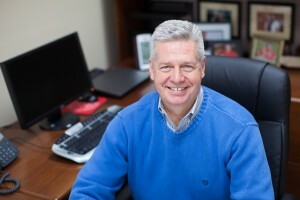 Jeffrey A. Gill is the dean, School of Ministry Studies, and professor of pastoral ministries at Grace Theological Seminary, Winona Lake, Ind. Great points Jeff!! Did you know I am back in a pastor role again after being away from it for over 15 years?? It is in a United Brethren Church north of Hastings. My wife grew up in a UB church near here. UBs are connected with Huntington Univ. in Indiana.